Fantastic property for those seeking tranquility and have a good time. A very quiet farmhouse in the Arrábida Natural Park. Ideal for those looking to spend a good time, be it between family or friends. With soccer field, swimming pool and spaces of leisure spread by the fifth. 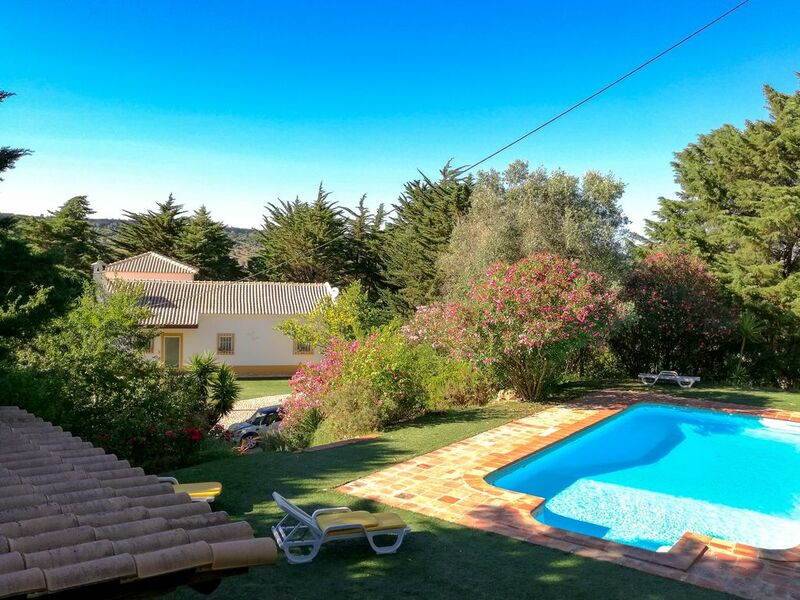 Close to fantastic beaches such as Portinho da Arrábida and Troia. The ideal home to escape from day-to-day life, with plenty of privacy and tranquility. Enjoy a bike ride while breathing in fresh air. Prices do not include the use of outdoor lighting spotlights and high-power projectors, such as the lighting of the football field. Prices do not include also the consumption of gas for central heating in winter. To request information consult the owner. Keep calm and enjoy ! A beautiful setting and amazing facilities. We thoroughly enjoyed the area too - lots to do. At times it was difficult to get in contact with the owner but when we did he was always very friendly and helpful. We had a fantastic stay in Pamela. The house was great for two families and we all loved the surroundings with the pool and the football field. We went to Setubal, Troia and Sesimbra and experienced the beaches, great food etc. Esteriores magníficos. Propietario agradable pero la limpieza estaba un poco justa. No había papel de baño (sólo el que estaba puesto). Local muito sossegado para os que desejam descanso, tranquilidade e acordar ao som dos passarinhos, literalmente. Perfeito para famílias! Campo de futebol 5 estrelas, mesa de ping-pong, piscina, cama de redes, etc, enfim para todos os gostos. Decoração de muito bom gosto e adequada à região. Cozinha e casa totalmente e muito bem equipada! Apenas lamento não ter levado o meu cãozinho para desfrutar (mas foi opção minha! pois a casa permite animais de estimação). O Sr. Francisco e filhos foram muito simpáticos, preocupados e prestáveis. Sem dúvida alguma que é uma experiência a repetir e recomendar a amigos e família. Mooi, authentiek huis, alles is goed verzorgd, koel van binnen en heel veel ruimte (met zon en schaduw) buiten. Hele aardige eigenaren die alle moeite doen om het je naar de zin te maken. Mooie ruime en koele eetkeuken, geweldig (diep) zwembad met ligstoelen, groot terras buiten. Prachtige tuin. Geschikt voor rustzoekers in natuurgebied, wat ook gerespecteerd moet worden. Geen vuur, maar gasbarbecue, vanwege brandgevaar. Stadje Setúbal ligt op 15 minuten rijden. Prachtige stranden in de omgeving (koud zeewater!). The property is in the Natural Park of Arrábida (although the pin on the map is in the wrong place). In our property you will enjoy an incomparable rest and tranquility. Take the A2 motorway.